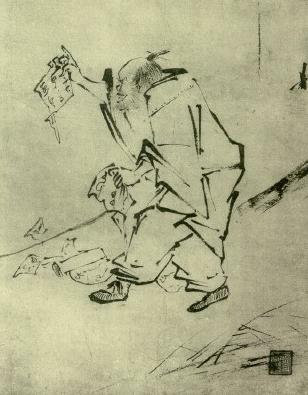 There is a Zen story about working very hard wherein a young student (in some versions, an American,) approaches the master and asks how long it will take him to become a master himself. The master replies, "ten years." The student emphatically explains that he will work twice as hard as any of the other students, pushing himself to the limit to master his teachings more quickly. "In that case," replies the master, "twenty years." For me, poetry is like this. Usually, when I find myself wanting to work very hard, it is because I have not been writing consistently. You see, I have waned in my discipline of getting up early before work to write. And, as a result, I notice myself daydreaming about dramatic change, such as a fellowship with a great expanse of uninterrupted writing time stretched out before me. Yet, invariably, I find that when I start writing consistently again, I become more satisfied and accepting of my present situation. My careerist thoughts subside. I enter back in to the vocation of poetry, the lifelong pursuit. The art of not pushing, but rather focusing on consistency, is alien to our fast-food culture. And yet, writing something daily is actually a form of instant gratification as well--a true and lasting gratification of actually having written, good or bad. It is also, ironically, good for one's career. That is because publication and awards are a numbers game. And writing consistently produces a greater volume of higher quality work than an approach of fits and starts. At least, that has been my experience so far. So, it's off to bed for me, and up early to bang something out--good or bad--for sake of staying in the flow. Categories: Insights and Poetry. Tags: Zen.